Are CDs really safe investments? Is it possible to lose money by investing in a certificate of deposit? The short answer is yes, but the long answer is that it depends on several different risk factors. The first question is, do you plan to own the CD until it matures? Holding a CD until it matures simply means that you intend to hold the CD until the end of the agreed upon term. If so, then it is almost impossible to lose money with a certificate of deposit(except for bank default). We will never say never, but by holding the CD until maturity, you are ensuring that you'll get the full original principal amount returned to you with interest. If you don't plan to hold the CD until it matures, then it is possible to lose money. If you buy the CD directly from the bank, in order to withdrawal your money before the maturity date, you will incur an early withdrawal fee or penalty. If not very much interest has accrued in the account, the early withdrawal fee may be greater than the interest earned, thus causing the account value to be less than when it started. If you buy a CD from a bank in the open market or through a broker such as TD Ameritrade, then you will likely be able to sell the CD back into the open market when you so choose. This is where the direction of interest rates will affect what the CD can be sold for. To understand this, you need to understand how interest rates affect debt investments such as CDs or bonds. As interest rates go up, the interest payments from the CD stays the same and the principal value of the CD at maturity stays the same. That means that if the person purchasing the CD from you is going to earn market interest rates, they need to pay less than the principal invested. Then, when the CD matures, they will earn some interest in the form of principal appreciation. This principal appreciation will cause them to earn a higher interest rate. As interest rates go down, the interest payments and the principal value of the CD at maturity continue to stay the same. However, this time, the person purchasing the CD will need to pay you more for the CD than the principal value. This means that as the CD matures, they will receive less than what they paid for the CD. Thus this will decrease their rate of return in line with market interest rates. This concept is identical to the bond market where one calculates the yield on a bond at maturity. It is also important to note that brokered CDs don't have a liquid secondary market which introduces a level of liquidity risk as well. The third way that bank CD can lose money is by the bank going into default or bankruptcy. Bank CD's are FDIC insured up to $250,000 per FDIC insured bank. That means if the investor has over $250,000 in a CD at one lender, then it is possible that they could lose some of their principal investment if the bank goes into default. Bank failures are typically pretty rare because of the regulations and standards that are in place to keep lending standards high. But when a recessionary event takes place like happened in 2008 and 2009, it can cause a spike in bank failures. 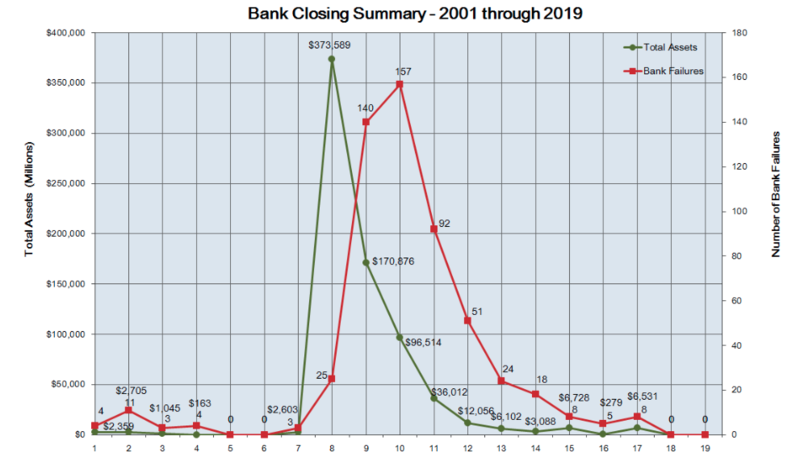 The FDIC website has a great interactive graphic that shows the number of banks that have failed each year between 2001 and 2019. The red line displays the number of bank failures and the green line shows the dollar amount those bank failures represent. The fourth way that CD's could lose money is inflation risk. Certificates of deposit pay a fixed rate of interest, and if inflation were to increase substantially, it could eclipse the interest being earned from the CD. In most years, inflation grows at around 2 to 3 percent and the Federal Reserve openly states that that is their goal. In the years where inflation is higher than this, it can mean inflation is eating away your CD's interest. But for the kind of people investing in CD's, this often beats the alternative risk. The risk of investing in some type of riskier asset such as the stock market that could decrease in principal value. Nonetheless, inflation gone wild can defeat the original purpose of the CD, capital preservation. To calculate the inflation risk on a CD, use a CD calculator like this one. Although CD's are a relatively conservative investment, they still come with their own unique set of risks. But by knowing the risks, one can try to avoid them as best as possible. Certificates are an investment that people go to when they want to protect and preserve capital. Even with the risks, CD's tend to do the job they were created for. To calculate the APY from a CD, use our APY Calculator.